Galician litterateur and philosopher; born at Brody Oct. 31, 1824; died at Leipsic Oct. 10, 1898. Up to his fifteenth year he studied Hebrew literature exclusively. At an early age he gave signs of great intellectual power, and was hailed as a genius. In the house of his father-in-law, I. Mieses, a scholar living in Dresden, he met, besides Rapoport and other Maskilim, his future teacher, M. Schöngut, who initiated him into the study of philosophy, and with whom he used to converse in Hebrew during their regular daily walks. At the same time he assiduously applied himself to the study of German, French, Italian, Latin, mathematics, and astronomy. In 1846 his German essay "Gegenwart und Vergangenheit im Judenthume" appeared in Fürst's "Orient"; and from that time he became assistant editor of and a regular contributor to that paper. In 1878 he published (at Lyck) a didactic poem entitled "Ha-Emunah weha-Tebunah," treating of Darwinism and its opponents. By this production he gained for himself a prominent and lasting place among Hebrew poets. Mieses was a prolific writer. Besides frequently contributing to various Hebrew and German periodicals, he wrote the following independent works: "Ha-Ḳabbalah weha-Ḥasidut" (Breslau, 1866; Odessa, 1871); "Ḳorot ha-Filusufiyah ha-Ḥadashah" (Leipsic, 1887), a history of modern philosophy from Kant to Mieses' own time; "Shirim" (Cracow, 1891), a collection of miscellaneous poems; "Die Bibel der Vernunft" (Leipsic, 1895). Upon this last work rests his chief claim to fame, as it is the first and only one of its kind which was written in the Hebrew tongue. Mieses was opposed to all religious reforms. Keneset Yisrael, p. 118, Warsaw, 1887. Austrian writer; born at Lemberg 1802; died in 1883. A very talented boy, he acquired at an early age a knowledge of the Talmud and kindred works. Later on he devoted himself mainly to philosophy. He removed to Thorn when nearly sixty years of age. His works include the following: "Beitrag zur Würdigung der Wirren im Judentum," Leipsic, 1845; "Zofnath Paneach: Darstellung und Kritische Beleuchtung der Jüdischen Geheimlehre," in two parts, Cracow, 1862; "Benedict Spinoza und Sein Verhältniss zum Kriticismus," in "Zeitschrift für Exacte Philosophie," vol. iii. ; and many other scientific essays published in various periodicals. E. Ginzig, Toledot Fabius Mieses, Cracow, 1890. At the tourney held at Cambridge Springs, Pa., in 1904, he was placed eighth, tying with Pillsbury. Mieses is the author of the following works on chess: "Kleines Lehrbuch des Schachspiels" (Leipsic); "Schachmeister-Partieen" (ib. ); and, with C. von Bardeleben, "Lehrbuch des Schachspiels" (ib. 1894). He edits also the chess columns of the "Berliner Tageblatt," "Leipziger Neueste Nachrichten," and "Zur Guten Stunde." C. T. Blanchard, Examples of Chess Master-Play, second series, p. 117, London, 1894. One of the most prominent Maskilim of Galicia; died at Lemberg 1831. He was a man of wealth and education, and made his house the center of a literary circle. He encouraged and aided Isaac Erter and other young men who showed eagerness for knowledge and selfculture, and he offered them the use of his valuable library. Mieses was a fluent Hebrew writer and a strong opponent of Ḥasidism. 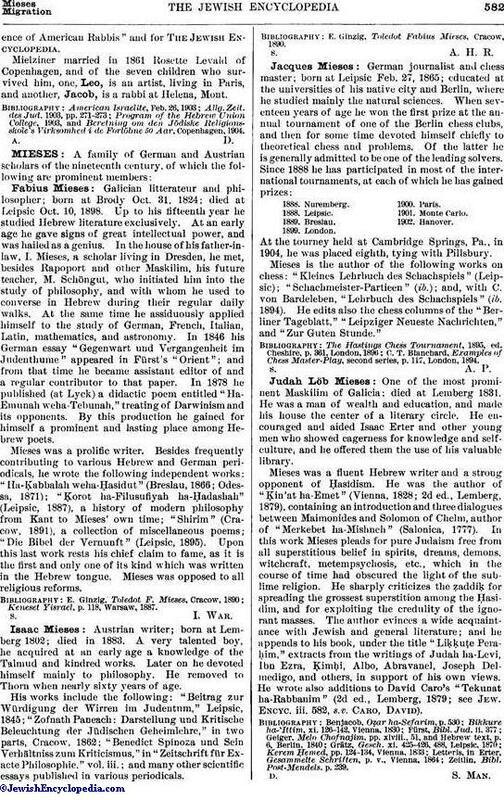 He was the author of "Ḳin'at ha-Emet" (Vienna, 1828; 2d ed., Lemberg, 1879), containing an introduction and three dialogues between Maimonides and Solomon of Chelm, author of "Merkebet ha-Mishneh" (Salonica, 1777). In this work Mieses pleads for pure Judaism free from all superstitious belief in spirits, dreams, demons, witchcraft, metempsychosis, etc., which in the course of time had obscured the light of the sublime religion. He sharply criticizes the ẓaddiḳ for spreading the grossest superstition among the Ḥasidim, and for exploiting the credulity of the ignorant masses. The author evinces a wide acquaintance with Jewish and general literature; and he appends to his book, under the title "LiḲḲuṭe Peraḥim," extracts from the writings of Judah ha-Levi, Ibn Ezra, Ḳimḥi, Albo, Abravanel, Joseph Delmedigo, and others, in support of his own views. He wrote also additions to David Caro's "Tekunat ha-Rabbanim" (2d ed., Lemberg, 1879; see Jew. Encyc. iii. 582, s.v. Caro, David). Zeitlin, Bibl. Post-Mendels. p. 239.